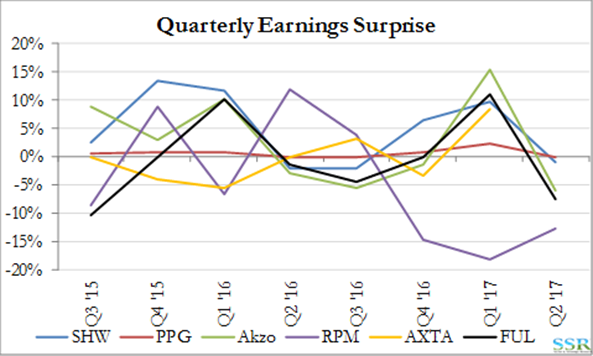 As we (and we suspect everyone else) expected, Azko failed to deliver against estimates for the second quarter, a first indication that the nonsense the company was projecting in its defense against PPG was just that – nonsense. The company missed both top and bottom line estimates but earnings for the year to date were still up versus 2016. Without further negative revisions for 2017 or some more reasonable guidance from the company we think this will be a pattern for the year. 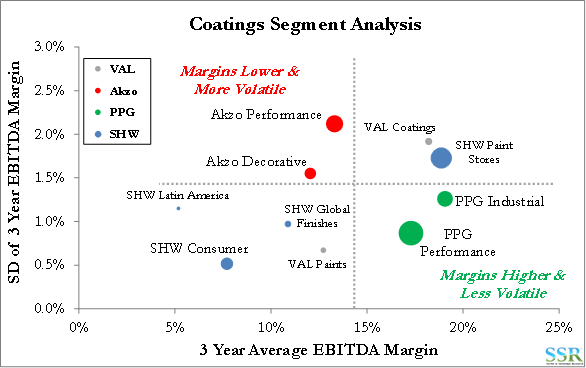 Business conditions in coatings are not great for anyone (Exhibit 1) – PPG’s earnings were down year on year in Q2, SHW is seeing a negative trend in same stores sales and RPM missed earnings significantly yesterday. Akzo is not in bad shape, or out of line with these results. This is why both SHW and PPG are looking for acquisitions and it is a similar pattern in other chemicals – growth is slow or non-existent and the best way to get earnings growth is to acquire/merge and drive synergies. Akzo suffers from extreme optimism – as we have shown in prior work – a lack of understanding of the reality within the businesses it operates and a strategy based more on hope than analysis. If the company had a realistic view of the challenges facing its business and the industries in which it operates, it would have embraced the PPG offer and we would be talking about a very different story today. So what next? The CEO is gone and the Chairman has stated that he too is leaving. As we wrote in our Friday email – Mr. Vanlancker gets a “hospital pass” and his best course of action is probably to beg PPG to come back to the table. There are options to run the business better – see Exhibit 2 – but PPG and SHW have the critical mass that Akzo can only get through density, which can only be achieved through M&A. Since the courtship ended on June 1, both PPG and Akzo have announced other acquisitions. Whether this changes PPG’s interest level or Akzo’s attractiveness remains to be seen. We believed that, barring some hidden liability at Akzo, collaborative due diligence could have yielded a price for Akzo above €100 per share back in March. If PPG can be lured back to the table, we do not believe that the same price is likely now, though PPG would probably still pay something close to its previous final offer. If Akzo sees the light and opens the doors to PPG, and/or others, the stock obviously has upside – otherwise expect a year of negative guidance and/or disappointments.